To my forever Valentine, you've made our lives sweeter and our hearts fuller. Thank you for making us whole little soul. I'll be here always, to hold you close and kiss your tears away. And I want you to never forget how magical you are Isla. We love you more than the earth, moon and all of the stars. I wore the Serenity sleep & nursing bra by Charley Maternity to the hospital when I went into labor. I was happy I wore it, I fed Isla right after she was born and the wireless design made it comfortable and easy. Mama's if you're planning on breastfeeding buy mum's butter! There aren't any yucky, harmful ingredients int it - which was extremely important to me since my little will be ingesting it. I wanted to get a jump start on increasing my milk supply so I packed a few Oat Mama bars in my hospital bag - I had one right after labor, paired with a chilled coconut water (I also packed a few in my bag - highly recommend), it was a great pick me up and both are so good for milk production. Another must have if you're planning on breastfeeding, I've had a beautiful experience so far - it's a much more enjoyable when you're not in pain. 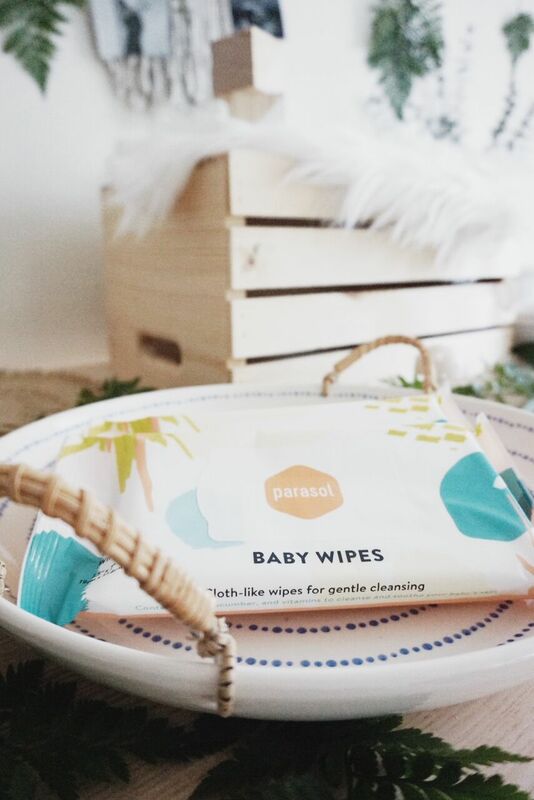 I packed these wipes to refresh post labor, of course the hospital has washcloths and towels but I wanted a nice cool wipe to cleanse my face and they were right in my bag! A little something sweet to look forward to every morning. It's been eleven incredible days with our little and I've had a beautiful breastfeeding journey so far - I'm going to share a little bit of my experience with ya. 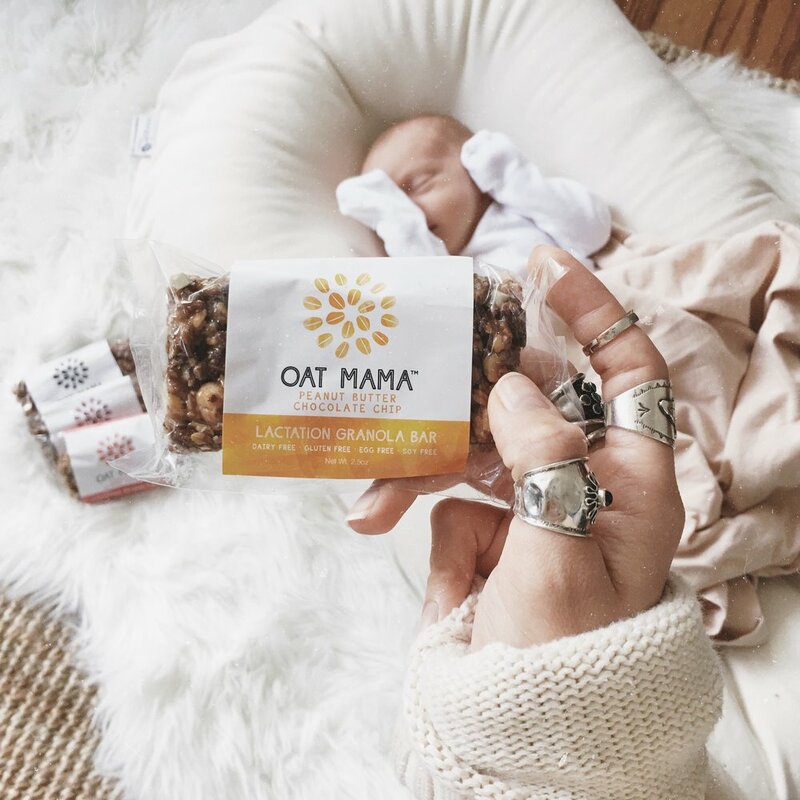 I packed my Oat Mama lactation bars in my hospital bag so I had one right after Isla was born, the second we were settled in our maternity suite I indulged and I've had one every day since. Breastfeeding Isla is extremely important to me, during my pregnancy I was so worried I'd have issues producing milk. It was the first morning home, day three and my milk came in - I was thrilled! The bars are full of natural, simple ingredients - ground flax, fenugreek (found in the delicious apple cinnamon flavor), gluten-free rolled oats and brewers yeast, and they are all milk making machines. I tried the sampler package so I could try all of the bars, the apple cinnamon raisin and peanut butter chocolate chip flavors were my favorite but they're all incredible. Today marks 39 weeks, 39 wonderful weeks spent watching you grow and feeling you kick little one - your nursery is nearly done and we can't wait to meet you. We have dreamt of this little room since we found out I was pregnant but everything stayed in boxes until we moved down here to Florida at the beginning of this month so watching it all come together has been so surreal. 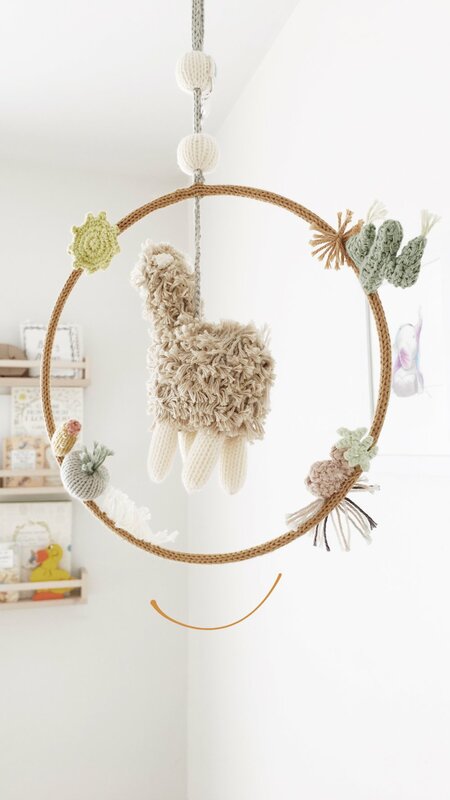 We knew we wanted neutral colors and unique, organic pieces - I'll be linking the details (the shops the toys / decor are from) in my next post - Nesting | Nursery Pt. 2. The little watercolor elephants above her crib were hand drawn by my step-dad years ago and I've had my eye on them since, they're the sweetest touch. I really wanted her nursery to be simple - not too busy with homes for all of her little things, so when I saw those blush pom pom storage baskets from Pehr I fell in love. I could seriously go crazy decorating with the pints, they look so cute on the changing table and are the perfect size for the diapers and wipes, and little things like her booties, socks and pacifiers. We're using the pom pom hamper as a toy drop for now and the grey stripe drum is full of her little onesies. I picked the round pom pom rug (in ivory) to pull the room together and am so pleased at how easy it is to clean. Take a peek at their site, they also have gorgeous duvet covers and shams for your littles - already looking forward to grabbing new goodies when she gets a little bit older. We designed our invitations, uploaded our design and sent them out via Paperless. It was one less thing to worry about and it made keeping up with the guest list crazy easy. I don't have a photo of this part of the invitation but we asked our quests to bring a book, instead of a card (whether it's new or used) and to sign something inside of it. So many of our quest did this for us and it was so special, we seriously can't thank them enough and are so excited to have a sweet little start to her book collection. We asked our quests to fill out little brown cards with advice for us and / or thoughts for the baby. These were so incredible to read - we're putting them in her baby book and can't wait to look back on them in a couple of years. Create a well-lit place to take photos with your guests. You'll want to look back on these moments for years so make sure they're pretty. I painted these wooden pieces to place on the table as decor for the shower and knew they would fit perfect in her nursery after the shower too and they do - I can't wait to see her play with them. They're so cute! If you're here looking for inspiration, I hope you found it here. To my fellow mums - I hope you have a magical day mama, you deserve it. here are bits from our dreamy day. Oh what a way to welcome our little one to this world, it was a dream come true. I love hosting and adore planning so it made sense for me to design and decorate myself - (I had some help from my incredible family and friends the morning of) and have the shower in our beautiful new home, so that's exactly what we did. I grabbed some inspiration from Pinterest and mommy blogs so I'm going to break down for you how I prepped and planned for my shower, hoping something here inspires you too. I didn't have (or want a) theme, I just knew I wanted palms, fern and pops of blush with organic wooden accents throughout. I ordered the greenery from a local floral shop here, picked up a mixed bouquet - mostly fern pieces and grabbed the eucalyptus from Trader Joes (the silver dollar eucalyptus worked well t for my outdoor backdrop). We went with a simple invitation design and sent them out via Paperless Post - try them out, the whole process was super easy, you can upload your own design and it's FREE. I wanted to make sure all of the decor was reusable - I grabbed four wooden blocks from Michaels craft store and painted the corners of them blush to match Isla's nursery, they are now up on her shelf tucked in between books and her wooden rattle. 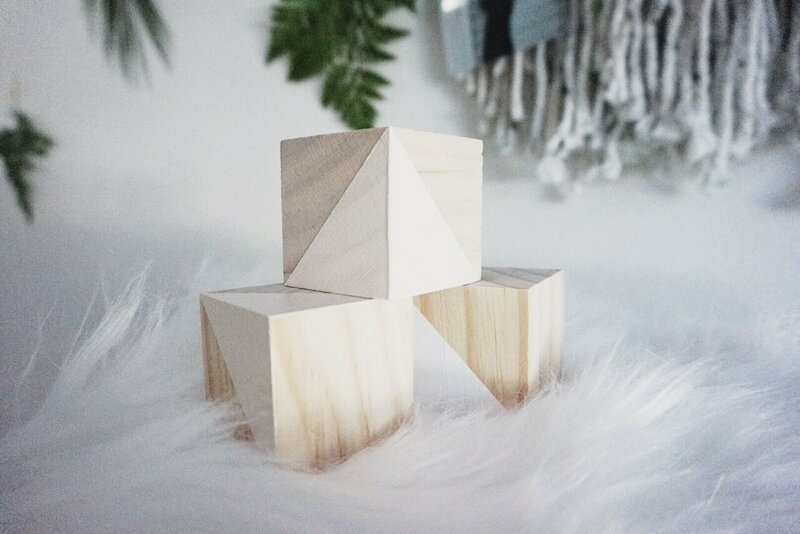 I grabbed the wooden mushrooms from Joanns and painted those blush too to match the blocks, they're also decor in her nursery - the perfect little pieces and I can't wait to see her play with them. I made the yarn and eucalyptus wall hanging (via this diy here) for the center piece of the greenery wall. I printed little black and white 4x4 photos to hang on it and place throughout the table - they were a sweet touch. The greenery surrounding the hanging was placed at random, I just went through and picked pieces that worked and I seriously never want to take it down, two days later and it's still insanely beautiful. I took the big pieces of fern and broke them up into little pieces to fill up the space around the table - tealight candles to add a little fairy-tale magic. I pulled apart a piece of eucalyptus and put them in ice trays for the la croix ice bucket and had white balloons floating throughout the space, I am all about the pretty simple touches can ya tell? 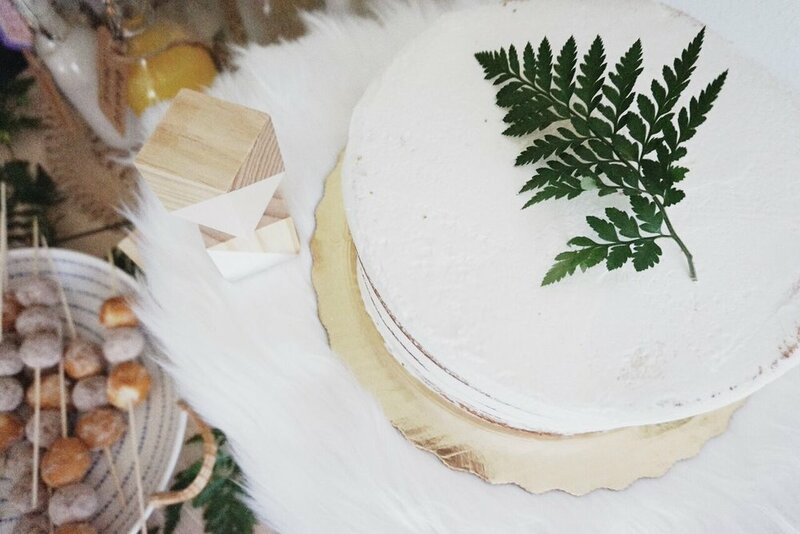 I picked up vanilla meringue cookies from Trader Joes and dusted them with cinnamon to achieve a mushroom / woodland look, they looked adorable with the little pieces of fern placed around them and aren't they just the sweetest little things, so yummy! There was a coffee bar, little white chocolate dipped marshmallow pops that my mom made (also so yummy), fresh fruit, glazed and cinnamon doughnut holes on skewers and a gorgeous naked cake from Publix - I planned on making it myself but my mom had me place the order through Publix - said I would thank her later and seriously, THANK YOU MOM - the cake turned out beautiful and it was one less thing to worry about, we just topped it with a fresh piece of fern and it was perfect. In the invitation we asked our guests to bring baby books instead of cards, almost everyone brought a book and wrote notes inside for our little one - it was seriously so special putting each book up in her nursery and we can't wait to read them to her. We also had an "advice for us, thoughts for baby" request, everyone wrote their advice and wishes for us on little cards. We've added those to her baby book as well as pressed pieces of fern from our day in there too. One last thing, I made sure to create a eucalyptus wall (the silver dollar eucalyptus worked perfect like I mentioned before) outside on our porch so we had a pretty, well-lit place to take pictures and it was stunning - it was a beautiful day spent creating the most precious memories. I've shared most of my journey with you - 6 of the 9 months I've told you how big she was each week, comparing her to fruits and vegetables and keeping ya posted on just how busy she is in my tummy. She'll be here soon so I've created Littlest Love to document the rest of this beautiful adventure. I'll be posting her nursery reveal, baby shower bits, favorite products, my dreams for her and more right here - we hope you'll follow along.